Writing and running tests is an important part of the Android app-development cycle. Well-written tests can help you catch bugs early in your development cycle, where bugs are easier to fix. Tests also help you gain confidence in your code. In user interface (UI) testing, you focus on aspects of the UI and the app&apos;s interactions with users. Recognizing and acting on user input is a high priority in UI testing and validation. You need to make sure that your app not only recognizes the type of input but also acts accordingly. As a developer, you should get into the habit of testing user interactions to ensure that users don&apos;t encounter unexpected results or have a poor experience when interacting with your app. UI testing can help you recognize the input controls where unexpected input should be handled gracefully or should trigger input validation. Note: We strongly encourage you to use Android Studio for building your test apps, because it provides project setup, library inclusion, and packaging conveniences. You can run UI tests on a variety of physical or virtual Android devices, and you can then analyze the results and make changes to your code without leaving the development environment. Exercise all UI events that use View elements. To do this, tap a View in the app and enter data or make a choice. Then examine the values of the properties of each View—referred to as the state of the UI—at different times during execution. Provide inputs to all UI View elements. Use this opportunity to test improper inputs. For example, input letters in a view where numbers are expected. Check the outputs and UI representations of data—such as strings and integers—to see if they are consistent with what you expect. In addition to functionality, UI testing evaluates design elements such as layout, colors, fonts, font sizes, labels, text boxes, text formatting, captions, buttons, lists, icons, links, and content. As the developer of an app, you probably test each UI component manually as you add the component to the app&apos;s UI. As development continues, one approach to UI testing is to simply have a human tester perform a set of user operations on the target app and verify that it is behaving correctly. Domain size: A UI has many operations that need to be tested. Even a relatively small app can have hundreds of possible UI operations. Over a development cycle a UI may change significantly, even though the underlying app doesn&apos;t change. Manual tests with instructions to follow a certain path through the UI may fail over time, because a button, menu item, or dialog may have changed location or appearance. Sequences: Some functionality of the app may only be accomplished with a sequence of UI events. For example, to add an image to a message about to be sent, a user may have to tap a camera button and use the camera to take a picture, or a photo button to select an existing picture, and then associate that picture with the message—usually by tapping a share or send button. Increasing the number of possible operations also increases the sequencing problem. When you automate tests of user interactions, you free yourself and your resources for other work. To generate a set of test cases, test designers attempt to cover all of the functionality of the system and fully exercise the UI. Performing all of the UI interactions automatically makes it easier to run tests for different device states (such as orientations) and different configurations. UI tests that work within a single app: Verifies that the app behaves as expected when a user performs a specific action or enters a specific input. It allows you to check that the app returns the correct UI output in response to user interactions in each app Activity. UI testing frameworks like Espresso allow you to programmatically simulate user actions and test complex intra-app user interactions. UI tests that span multiple apps: Verifies the correct behavior of interactions between different user apps or between user apps and system apps. For example, you can test an app that launches the Maps app to show directions, or that launches the Android contact picker to select recipients for a message. UI testing frameworks that support cross-app interactions, such as UI Automator, allow you to create tests for such user-driven scenarios. The Espresso testing framework, in the Android Testing Support Library, provides APIs for writing UI tests to simulate user interactions within a single app. Espresso tests run on actual device or emulator and behave as if an actual user is using the app. The app returns the correct UI output in response to a sequence of user actions on a device. The app&apos;s navigation and input controls bring up the correct Activity and View elements. The app responds correctly with mocked-up dependencies, such as data from an outside server, or can work with stubbed out backend methods to simulate real interactions with backend components which can be programmed to reply with a set of defined responses. A key benefit of using Espresso is that it has access to instrumentation information, such as the context for the app, so that you can monitor all of the interaction the Android system has with the app. Another key benefit is that it automatically synchronizes test actions with the app&apos;s UI. Espresso detects when the main thread is idle, so it is able to run your test at the appropriate time, improving the reliability of your tests. This capability also relieves you from having to add any timing workarounds, such as a sleep period, in your test code. The Espresso testing framework works with the AndroidJUnitRunner test runner and requires instrumentation, which is described later in this section. Espresso tests can run on devices running Android 2.2 (API level 8) and higher. The UI Automator testing framework in the Android Testing Support Library can help you verify the correct behavior of interactions between different user apps or between user apps and system apps. It can also show you what is happening on the device before and after an app is launched. The UI Automator APIs let you interact with visible elements on a device. Your test can look up a UI element by using descriptors such as the text displayed in that element or its content description. A viewer tool provides a visual interface to inspect the layout hierarchy and view the properties of UI elements that are visible on the foreground of the device. Like Espresso, UI Automator has access to system interaction information so that you can monitor all of the interaction the Android system has with the app. Your test can send an Intent or launch an Activity (without using shell commands) by getting a Context object through getContext(). You can simulate user interactions on a collection of items, such as songs in a music album or a list of emails in an inbox. You can simulate vertical or horizontal scrolling across a display. You can use standard JUnit Assert methods to test that UI components in the app return the expected results. The UI Automator testing framework works with the AndroidJUnitRunner test runner and requires instrumentation, which is described in the next section. UI Automator tests can run on devices running Android 4.3 (API level 18) or higher. Android instrumentation is a set of control methods, or hooks, in the Android system, which control Android components and how the Android system loads apps. Normally the system runs all the components of an app in the same process. You can allow some components, such as content providers, to run in a separate process, but you typically can&apos;t force an app onto the same process as another running app. Instrumentation tests, however, can load both a test package and the app into the same process. Since the app components and their tests are in the same process, your tests can invoke methods in the components, and modify and examine fields in the components. Instrumentation allows you to monitor all of the interaction the Android system has with the application, and makes it possible for tests to invoke methods in the app, and modify and examine fields in the app, independently of the app&apos;s normal lifecycle. Normally, an Android component runs in a lifecycle that the system determines. For example, an Activity object&apos;s lifecycle starts when an Intent activates the Activity. The system calls the object&apos;s onCreate() method, and then the onResume() method. When the user starts another app, the system calls the onPause() method. If the Activity code calls the finish() method, the system calls the onDestroy() method. The Android framework API does not provide a way for your app&apos;s code to invoke these callback methods directly, but you can do so using an Espresso or UI Automator test with instrumentation. To use the Espresso and UI Automator frameworks, you need to store the source files for instrumented tests at module-name/src/androidTests/java/ (in which module-name is the name of the app or module). This directory already exists when you create a new Android Studio project. In the Project > Android view of Android Studio, show this directory by navigating to app > java > module-name (androidTest). Install the Android Support Repository and the Android Testing Support Library. Add dependencies to the project&apos;s build.gradle (Module: app) file. Create test files in the androidTest directory. In Android Studio select Tools > Android > SDK Manager. Click the SDK Tools tab and look for the Support Repository. If necessary, update or install the library. When you start a project for the Phone and Tablet form factor using API 15: Android 4.0.3 (Ice Cream Sandwich) as the minimum SDK, Android Studio automatically includes the dependencies you need to use Espresso. Note: If you created your project in a previous version of Android Studio, you may have to add the dependencies and instrumentation statement yourself. Open the build.gradle (Module: app) file. If the file doesn&apos;t include the above dependency statements, enter them into the dependencies section. If the file doesn&apos;t include the above instrumentation statement, enter it at the end of the defaultConfig section. If you modified the build.gradle (Module: app) file, click the Sync Now link in the notification about Gradle files in top right corner of the window. To write tests, Espresso and UI Automator use JUnit as their testing framework. JUnit is the most popular and widely-used unit testing framework for Java. Your test class using Espresso or UI Automator should be written as a JUnit 4 test class. Note: The most current JUnit revision is JUnit 5. However for the purposes of using Espresso or UI Automator, version 4.12 is recommended. To create a basic JUnit 4 test class, create a Java class for testing in the directory specified at the beginning of this section. It should contain one or more methods and behavior rules defined by JUnit annotations. To create an instrumented JUnit 4 test class, add the @RunWith(AndroidJUnit4.class) annotation at the beginning of your test class definition, which indicates the runner that will be used to run the tests in this class. A test runner is a library or set of tools that enables testing to occur and the results to be printed to a log. The @SmallTest, @MediumTest, and @LargeTest Android annotations provide some clarity about what resources and features the test uses. For example, the @SmallTest annotation tells you that the test doesn&apos;t interact with any file system or network. For a description of the Android @SmallTest, @MediumTest, and @LargeTest annotations, see Test Sizes in the Google Testing Blog. For a summary of JUnit annotations, see Package org.junit. This rule uses an ActivityTestRule object, which provides functional testing of a single Activity—in this case, MainActivity.class. ServiceTestRule is a JUnit rule that provides a simplified mechanism to start and shut down your service before and after the duration of your test. It also guarantees that the service is successfully connected when starting (or binding to) a service. The Activity under test will be launched before each test annotated with @Test. During the duration of the test you will be able to manipulate your Activity directly. In certain rare cases you may need to set up variables or execute a sequence of steps before or after performing the UI test. You can specify methods to run before running a @Test method, using the @Before annotation, and methods to run after, using the @After annotation. @Before: The @Test method will execute after the methods designated by the @Before annotation. The @Before methods terminate prior to the execution of the @Test method. @After: The @Test method will execute before the methods designated by the @After annotation. When writing tests it is sometimes difficult to get the balance right between over-specifying the test or not specifying enough. Over-specifying the test can make it brittle to changes, while under-specifying may make the test less valuable, since it continues to pass even when the UI element and its code under test is broken. To make tests that are balanced, it helps to have a tool that allows you to pick out precisely the aspect under test and describe the values it should have. Such tests fail when the behavior of the aspect under test deviates from the expected behavior, yet continue to pass when minor, unrelated changes to the behavior are made. The tool available for Espresso is the Hamcrest framework. Hamcrest (an anagram of "matchers") is a framework that assists writing software tests in Java. The framework lets you create custom assertion matchers, allowing match rules to be defined declaratively. Tip: To learn more about Hamcrest, see The Hamcrest Tutorial. Match a View: Find a View. Perform an action: Perform a click or other action that triggers an event with the View. Assert and verify the result: Check the state of the View to see if it reflects the expected state or behavior defined by the assertion. ViewMatchers: Hamcrest matcher expressions in the ViewMatchers class that lets you find a View in the current View hierarchy so that you can examine something or perform some action. ViewActions: Hamcrest action expressions in the ViewActions class that lets you perform an action on a View found by a ViewMatcher. ViewAssertions: Hamcrest assertion expressions in the ViewAssertions class that lets you assert or check the state of a View found by a ViewMatcher. Others including matchers for state (selected, focused, enabled), and content description and hierarchy (root and children). You would typically combine a ViewMatcher and a ViewAction in a single statement, followed by a ViewAssertion expression in a separate statement or included in the same statement. Why is the Hamcrest framework useful for tests? A simple assertion, such as assert (x == y), lets you assert during a test that a particular condition must be true. If the condition is false, the test fails. But the simple assertion provides no useful error message. With a family of assertions, you can produce more useful error messages, but this leads to an explosion in the number of assertions. With the Hamcrest framework, it is possible to define operations that take matchers as arguments and return them as results, leading to a grammar that can generate a huge number of possible matcher expressions from a small number of primitive matchers. For a Hamcrest tutorial, see The Hamcrest Tutorial. For a quick summary of Hamcrest matcher expressions, see the Espresso cheat sheet. In an AdapterView such as a Spinner, the View is dynamically populated with child View elements at runtime. If the target View you want to test is inside a spinner, the onView() method might not work because only a subset of the View elements may be loaded in the current view hierarchy. Espresso handles this by providing a separate onData() method, which is able to first load the adapter item and bring it into focus prior to operating on it or any of its children views. The onData() method uses a DataInteraction object and its methods, such as atPosition(), check(), and perform() to access the target View. Espresso handles loading the target View element into the current View hierarchy, scrolling to the target child View, and putting that View into focus. An item that is equal to the String "Americano"
allOf: Causes a match if the examined object matches all of the specified matchers. You can use allOf() to combine multiple matchers, such as containsString() and instanceOf(). is: Hamcrest strives to make your tests as readable as possible. The is matcher is a wrapper that doesn&apos;t add any extra behavior to the underlying matcher, but makes your test code more readable. instanceOf: Causes a match when the examined object is an instance of the specified type; in this case, a string. This match is determined by calling the Class.isInstance(Object) method, passing the object to examine. * checking to see if it matches the string in the array. // Iterate through the spinner array of items. // Find the spinner and click on it. // Find the spinner item and click on it. // is part of the string. The test clicks each Spinner item from top to bottom, checking to see if the item appears in the text field. It doesn&apos;t matter how many Spinner items are defined in the array, or what language is used for the Spinner items—the test performs all of them and checks their output against the array. In the statement above, the test accesses the array (with the id labels_array) by establishing the context with the getActivity() method of the ActivityTestRule class, and getting a resources instance in the app&apos;s package using getResources(). Using the length (size) of the array, the for loop iterates through each Spinner item. The Spinner is populated from the myArray array, so myArray[i] represents a Spinner element from the array. As the for loop iterates, it performs a click on each Spinner element (myArray[i]) it finds. An Android Studio feature (in version 2.2 and newer) lets you record an Espresso test, creating the test automatically. After choosing to record a test, use your app as a normal user would. As you click through the app UI, editable test code is generated for you. Add assertions to check if a View holds a certain value. You can record multiple interactions with the UI in one recording session. You can also record multiple tests, and edit the tests to perform more actions, using the recorded code as a snippet to copy, paste, and edit. Select Run > Record Espresso Test, select your deployment target (an emulator or a device), and click OK. Interact with the UI to do what you want to test. In this case, tap the plus (+) ImageButton for Team 1 in the app. The Record Your Test window shows the action that was recorded ("Tap AppCompatImageButton with the content description Plus Button"). Click Add Assertion in the Record Your Test window. A screenshot of the app&apos;s UI appears in a pane on the right side of the window, and the Select an element from screenshot option appears in the dropdown menu. Select the score (1) in the screenshot as the UI element you want to check, as shown in the figure below. Select text is from the second dropdown menu, as shown in the figure below. The text you expect to see (1) is already entered in the field below the dropdown menu. Click Save Assertion, and then click OK. In the dialog that appears, edit the name of the test so that it is easy for others to understand the purpose of the test. Expand com.example.android.appname (androidTest) to see the test, and right-click (or Control-click) the test to run it. A RecyclerView is useful when you have data collections with elements that change at runtime based on user action or network events. RecyclerView is a UI component designed to render a collection of data, but is not a subclass of AdapterView but of ViewGroup. This means that you can&apos;t use onData(), which is specific to AdapterView, to interact with list items. UI Automator is a set of APIs that can help you verify the correct behavior of interactions between different user apps, or between user apps and system apps. It lets you interact with visible elements on a device. A viewer tool provides a visual interface to inspect the layout hierarchy and view the properties of UI components that are visible on the foreground of the device. 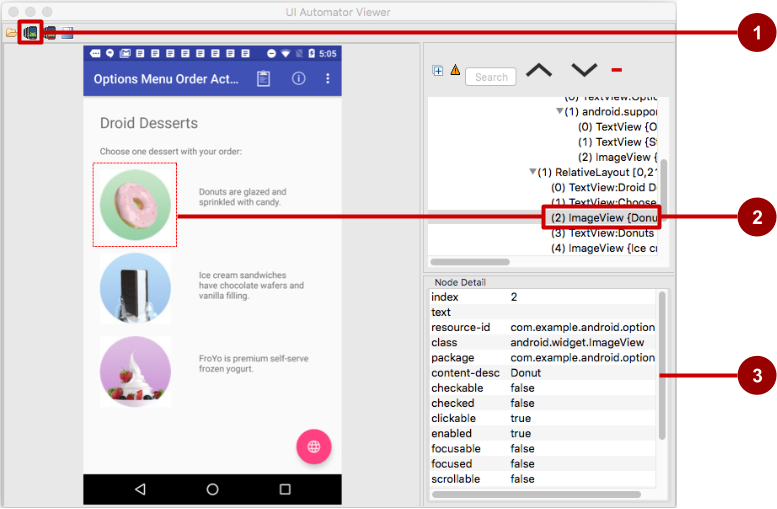 Like Espresso, UI Automator has access to system interaction information so that you can monitor all of the interaction the Android system has with the app. 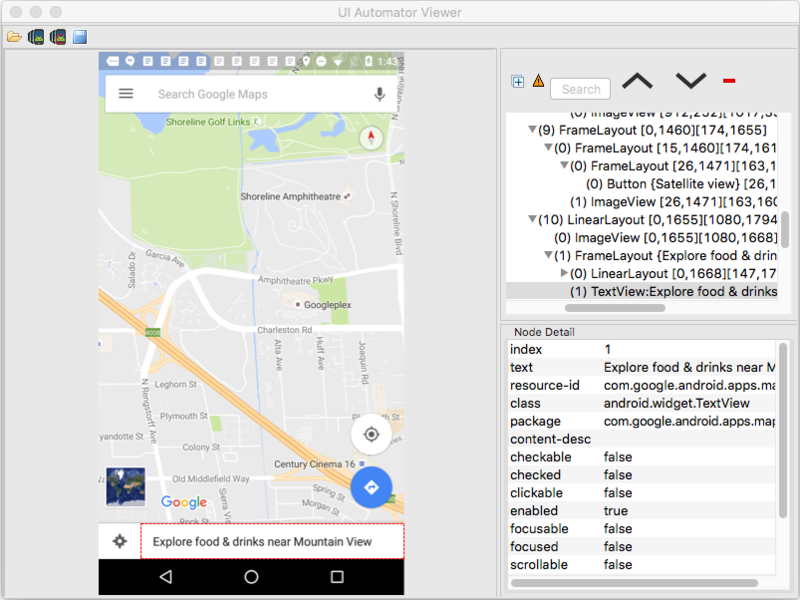 UI Automator Viewer (uiautomatorviewer) provides a convenient visual interface to inspect the layout hierarchy and view the properties of UI elements that are visible on the foreground of the device. Install and then launch the app on a physical device such as a smartphone. Connect the device to your development computer. Open a terminal window and navigate to the /tools/ directory. To find the specific path, select Preferences in Android Studio, and select Appearance & Behavior > System Settings > Android SDK. The full path for appears in the Android SDK Location box at the top of the screen. After launching uiautomatorviewer, the viewer is empty. Click the Device Screenshot button. Hover over a UI element in the snapshot in the left-hand panel to see the element in the layout hierarchy in the upper right panel. The layout attributes and other properties for the UI element appear in the lower right panel. Use this information to create tests that select a UI element that matches a specific visible attribute or property. Tap the floating action button. The code for the button makes an implicit intent to launch the Maps app. Click the Device Screenshot button to see the result of the implicit Intent (the Maps screen). Using the viewer, you can determine which UI elements are accessible to the UI Automator framework. You can make input controls more accessible for the sight-impaired by using the android:contentDescription XML layout attribute. The text in this attribute does not appear on screen, but if the user enables accessibility services that provide audible prompts, then when the user navigates to that control, the text is spoken. Provide an android:hint attribute for EditText elements (in addition to android:contentDescription, which is useful for accessibility services). With EditText elements, UI Automator looks for the android:hint attribute. 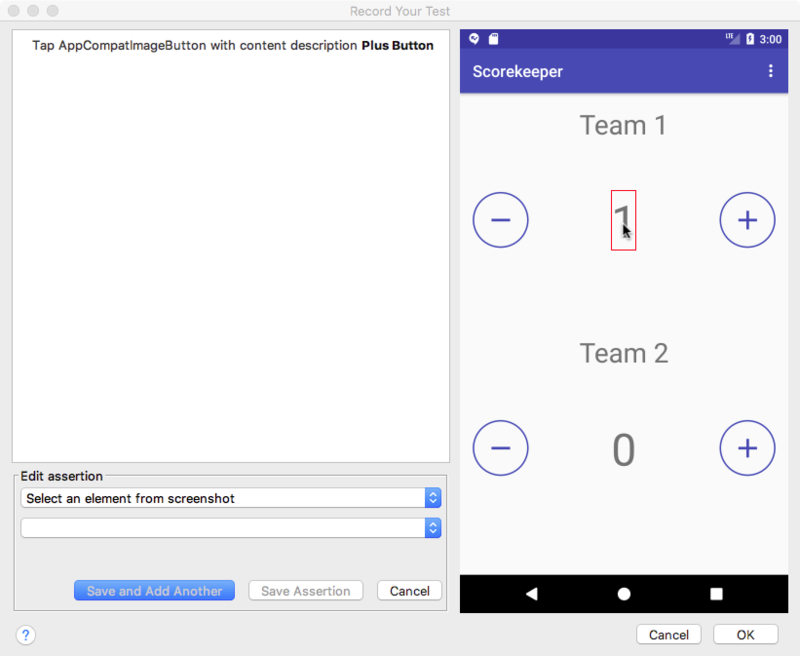 Associate an android:hint attribute with any graphical icons used by controls that provide feedback to the user (for example, status or state information). As a developer, you should implement the above minimum optimizations to support your users as well as UI Automator. You may want to call setText() to set the text for a TextView, or performMultiPointerGesture() to simulate a multi-touch gesture. You can repeat steps 2 and 3 as needed to test more complex user interactions that involve multiple UI elements or sequences of user actions. The UiDevice class provides the methods for accessing and manipulating the state of the device. Unlike Espresso, UI Automator can verify the correct behavior of interactions between different user apps, or between user apps and system apps. It lets you interact with visible elements on a device. In your tests, you can call UiDevice methods to check for the state of various properties, such as current orientation or display size. Your test can use the UiDevice object to perform device-level actions, such as forcing the device into a specific rotation, pressing D-pad hardware buttons, and pressing the Home button. The @SdkSuppress(minSdkVersion = 18) annotation ensures that tests will only run on devices with Android 4.3 (API level 18) or newer, as required by the UI Automator framework. Use the findObject() method of the UiObject class to retrieve a UiObject instance that represents a UI element matching a given selector criteria. To access a specific UI element, use the UiSelector class, which represents a query for specific elements in the currently displayed UI. You can reuse the UiObject instances that you created in other parts of your app testing. The UI Automator test framework searches the current display for a match every time your test uses a UiObject instance to click on a UI element or query an attribute. If more that one element matches, the first matching element in the layout hierarchy (found by moving from top to bottom, left to right) is returned as the target UiObject. When constructing a UiSelector, you can chain together multiple attributes and properties to refine your search. If no matching UI element is found, an exception (UiAutomatorObjectNotFoundException) is thrown. While it may be useful to refer to the android:text attribute of an element of a ListView or RecycleView because there is no resource id (android:id attribute) for such an element, it is best to use a resource id when specifying a selector rather than the android:text or android:contentDescription attributes. Not all elements have a text attribute (for example, icons in a toolbar). Tests might fail if there are minor changes to the text of a UI element, and the tests would not be usable for apps translated into other languages because your text selectors would not match the translated string resources. click(): Tap (click) the center of the visible bounds of the UI element. dragTo(): Drag the object to arbitrary coordinates. setText(): Set the text in an editable field, after clearing the field&apos;s content. Conversely, you use the clearTextField() method to clear the existing text in an editable field. swipeUp(): Perform the swipe up action on the UiObject. Similarly, the swipeDown(), swipeLeft(), and swipeRight() methods perform corresponding actions. // Launch a simple calculator app. // Clear out any previous instances. Use the UiCollection class if you want to simulate user interactions on a collection of UI elements (for example, song titles or emails in a list). To create a UiCollection object, specify a UiSelector that searches for a UI container or a wrapper of other child UI elements, such as a layout group that contains child UI elements. To run a single test, right-click (or Control-click) the test in Android Studio, and select Run from the pop-up menu. To test a method in a test class, right-click (or Control-click) the method in the test file and click Run. To run all tests in a directory, right-click (or Control-click) on the directory and select Run tests. 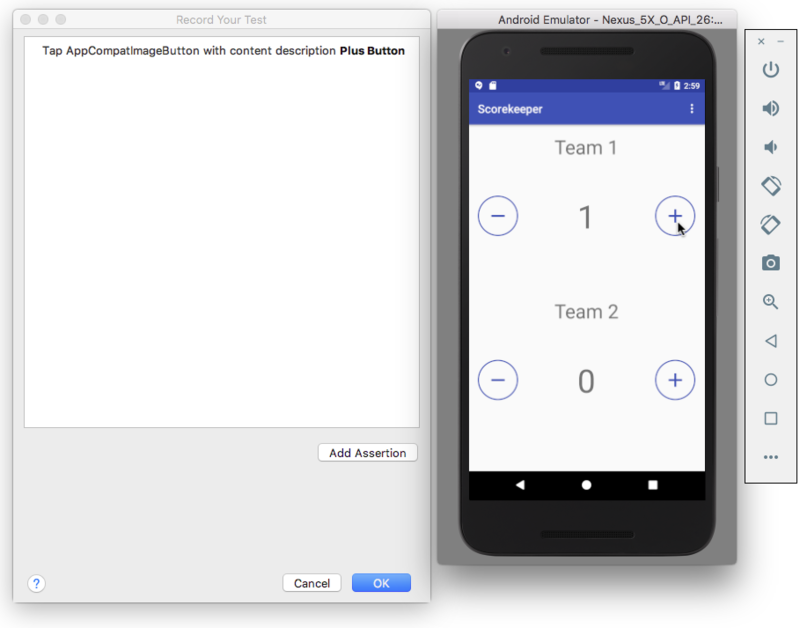 Android Studio displays the results of the test in the Run window. The related practical is 6.1: Espresso for UI testing. Atomic Object: "Espresso – Testing RecyclerViews at Specific Positions"
Stack Overflow: "How to assert inside a RecyclerView in Espresso?"